This is it. This is the salsa recipe that ruined everything. My life, you see, used to be so simple, where salsa was concerned. Then. I learned how to grow heirloom tomatoes, and I started growing more and more of them. My life changed. I canned the tomatoes that we didn’t eat, but soon I had more than we could use in canned form, so I started looking for other ways to use up my tomato surplus. 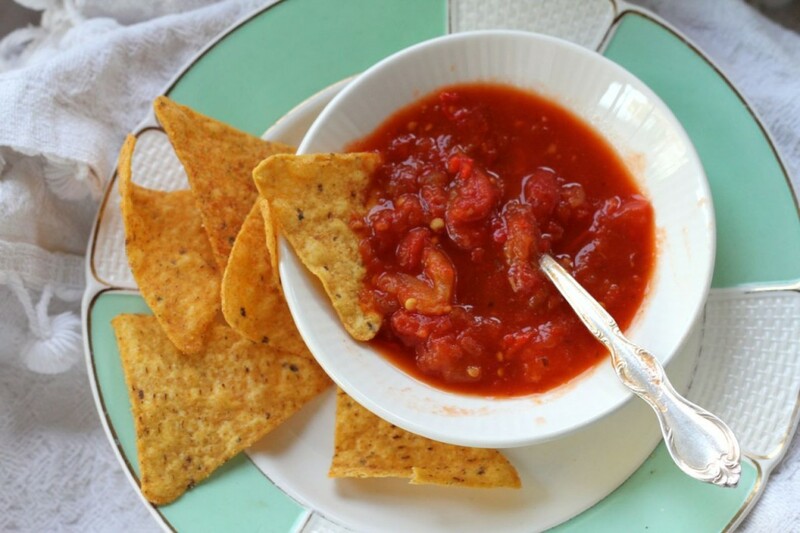 I tried some of my sister-in-law Paula’s homemade salsa one day, and it was so delicious that I begged her for the recipe. Paula respondswelltoaheadlock is a generous lady, and she handed it over 😉 and I started making my own. And it ruined everything. Now I can’t buy salsa any longer. You know, Gentle Reader, how many types of salsa there are in the store? Many. Many, many, many types of salsa. Lots of tantalizing combinations. Pineapple-mango. Sweet and spicy. Habanero sweet onion. Bacon lizard. And the like. You realize, of course, how much simpler my life would be if I could just go to the store and buy salsa, like a normal person, when we run out. But no. That wouldn’t do, now that my family has tasted this salsa. It’s so good and so fresh and so full of flavors, and it is just addicting. Once you’ve tasted it, nothing else will do. This is it. The Salsa that will ruin everything. One of the first years that I put up a very big quantity of this salsa (like, 100 quarts) all the kids were still home, and Matthew and Andrew were growing teenagers, and we’d go through a quart jar in just a day or two. Every day or two. During our school morning, I’d announce that it was time for history (during which I’d settle into the living room with all the kids and read aloud to them from our current history books, and they’d take notes and eat snacks. Mostly, eat snacks.) and the boys would drag out a jar of salsa from the ‘fridge, and a bag of tortilla chips (and woe to the mama who forgot to buy tortilla chips that week! Woe, woe!) and fill a bowl with each. I would watch them with envy, being able to eat all those chips and still stay lean as they were. The notable thing about that fall and winter was that I don’t remember us getting sick at all. I don’t remember the usual flu or colds going through the household, and I’ve always believed that it was because of the copious amounts of salsa that we ate. Think of it. Garden-grown onions, garlic, peppers, herbs, and of course heirloom tomatoes, picked when they are ripe, and then cooked into a delicious sauce. What could be better for you? Probably nothing. Garlic and onions are so packed with antioxidants and cancer-fighting properties, and did you know that tomatoes are even better for you (actually, the cancer-preventing substance lycopene) if you cook them for a time? It’s true. To be fair, occasionally (like last year!) I didn’t put up enough of this stuff to last us all winter, or I just gave away too many jars of it, and we ran out. Then we did buy salsa, but it just sat in the ‘fridge, largely uneaten, because it’s not Mom’s homemade salsa. Friends actually come out to our house, with money (of all things!) in their hands, wanting to buy a jar of this stuff. It is just that good. And now that I’ve explained why it ruined everything, you really need to try it for yourself, don’t you think? Don’t you want to ruin everything, too? 😉 And by the way, if you have to buy the onions or peppers, or if you can only find the regular red hybrid tomatoes at the market to make it with, don’t despair. I’m sure it’ll be quite delicious, just the same. The Salsa that will ruin everything. You can vary the ingredients in this salsa, as in---chili peppers instead of jalapenos, or cilantro instead of cumin, but keep all the proportions the same, if you plan to can it. First, skin and chop and drain (see note above) tomatoes. Chop peppers, garlic, onions, and add them with all other ingredients to very large stock pot (use one with a thick bottom, or you'll risk scorching it and ruining the entire batch). Bring to boil. Lower heat and simmer for about 2 hours, occasionally stirring, making sure that it's not sticking on the bottom of the pot. Meanwhile, bring a canning pot of water to boil and wash jars in hot water (I use the dishwasher for this). Put lids in a pan of water to simmer, and get rings ready. Transfer hot salsa to hot jars, leaving ½" headspace, apply lids and rings and process in boiling water bath for 20 minutes. Remove from water bath and listen for the "ping!" that ensures your jars are sealed. Refrigerate and use any salsa in jars that don't seal. Now that I’ve finished this post, I think it’s time for a snack . . .
By the way. I’m linking with The Prairie Homestead and the Home Matters Linky party today. Come join me! This looks wonderful, I can’t wait to make it! You’ll love it, Katie! Everybody does! Got it, pinned it, now I need tomatoes… My tomatoes are long gone. 🙁 Will save this for next summer. Love the depth of color in the pic! I always add salsa to my taco mix when I’m making it, very good! Also, it’s good in winter soups! Sounds like you hit a home run with this one or is it passed for a touchdown this time of year? Anyway keep some on hand, when we get there I will want to taste it. We are not doing any canning this year do to the pending trip. Fresh salsa is a big part of our lives and I don’t think there is any way we could buy the bottled stuff. We love salsa, and fresh is always better. I will have to try this, but since I am leaving in 2 days for 3 weeks in SD at my sisters, I’m not sure when I’ll get to make it. Thanks for sharing the recipe. There are tomatoes in SD, Terry, I’m sure of it! Might be a fun sister project! I don’t remember you ever buying salsa! I think all my wonderful memories of homemade salsa has blocked out any memories of salsa from the store. 🙂 What a creative post! Love it! Thanks Sweetie. We did buy salsa. It was the “Pace” brand, because it came in the huge tub. We never ate it all. Well. This is awkward… I would like a few (a lot like tons) of this in large containers of happy goodness in my face please? Alana, if you ever get an overabundance of tomatoes, this is a great way to put them to use! I bought cilantro yesterday (my garden cilantro is long gone) because I want to make a batch today with cilantro and parsley instead of cumin. Absolutely! This recipe is a great use of your frozen tomatoes. 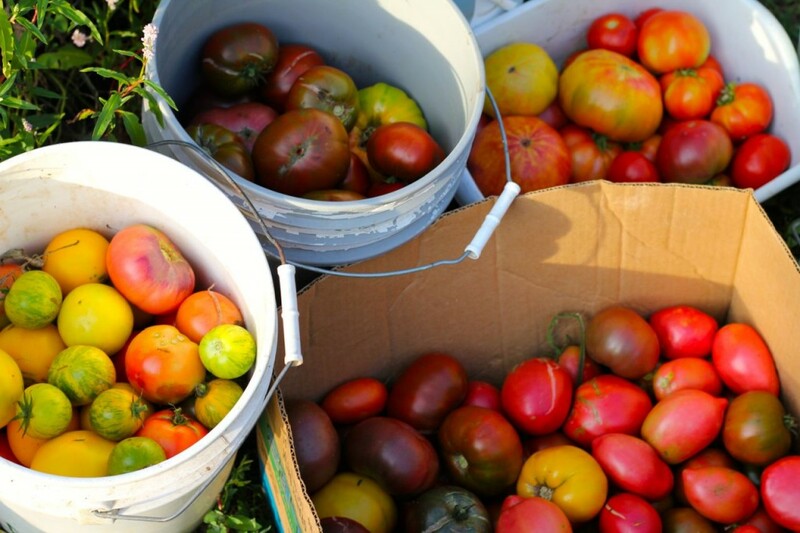 If I had freezer space, I’d sock away tomatoes for later canning, too, but woe–woe, woe–my freezer is already full. And me with bushels of tomatoes wanting picking, too! .I used to live in San Antonio and this is where I developed a love for fresh Salsa. But when I moved away, I bought it from Sam’s Club and like you, sometimes it got eaten and sometimes not. My sister is the one who REALLY loves it. and they grow tomatoes. I will give her your recipe. Thanks so much for sharing it! OMG my mouth watered as I read your post. I’ve done home made salsa before but using store bought tomatos as my tomatoes at home are the size of quarters – no sun, all shade and I forget to water, especially with this draught. I will definitely have to try your recipe when I have a decent garden of my own! Elisa, it’s worth it to plant a few more tomato plants just to have plenty to make lots of this salsa! I didn’t have enough tomatoes so I bought the big can of chopped tomatoes at the store and used them along with the ones we grew. They worked just fine. Well done, Dottie! I would do the same thing, if I needed to. Thanks for the tip! I loved the title, Amy! It was very dramatic and drew me in immediately! Sophie, oh good–and I consider that quite a compliment, since you are a title-writing guru, yourself! This is the best morning ever! When I woke up, I found your recipe for salsa and I was so excited. Now I will make some salsa. Right now my tomatoes are taking a little rest, but the green ones promise me that I will have enough to make salsa this year yet! Whoopee!! Thank you so much, Amy, for sharing this with us. I think I am going to name my brand new, just-got-here-yesterday Blue Ameraucana baby girl “Amy” just for you by way of celebrating this wonderful day. I hope you don’t mind sharing your name with a chickie baby! Oh, Mari, you just made my day!! Oooh this salsa sounds SO yummy! I’ve been looking for a good salsa recipe. I may have to try this! Thanks for sharing. Tomorrow when I get home from the farmers market, I will have to make this with the tomatoes from our garden. Made this tonight – sampled before processing – yummo! Gwendolen, I have another batch bubbling on the stove right now . . . thinking about making it our supper tonight. . . chips, warm salsa, melted cheese . . . some greens . . . yum! Oh the joys so salsa! I seriously want to make this. This looks so delicious, I truly understand why it would ruin everything! I agree with the kids, eat salsa and chips instead of listening to some history story:) Thanks for linking with Home Matters Linky! Did you peel the tomatoes before chopping, etc.? Planning on trying this tomorrow. Ann, You don’t have to peel the tomatoes, but it does make a difference. If you don’t mind little bits of skin throughout, you don’t have to peel them. However it doesn’t take long to peel them (I dip them for a few seconds in boiling water and the skin slides right off) and I prefer it that way. Isn’t it good, Nathana? Just don’t forget the salt, like I did last year. It’s not nearly so good then! We will try not to! We are making a HUGE batch today! 🙂 We are excited. Though, we are nervous about the salt, not because we doubt your recipe, but because every time we try dill pickles, they end up way too salty. Do you have a dill pickle recipe? Could this recipe be halved? Usually I don’t go back to a website to comment. I just make the recipe and enjoy it but this recipe deserves a comment. 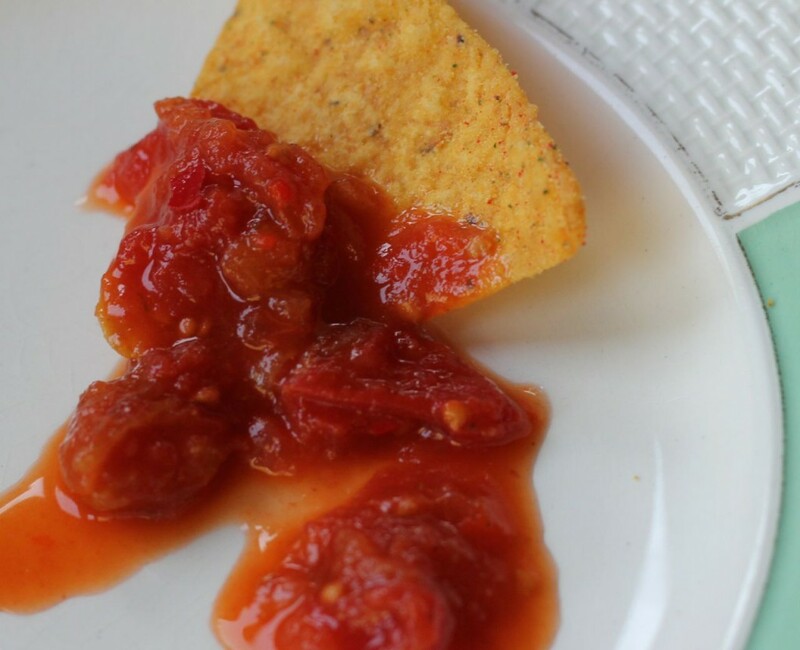 It is the best salsa I have ever made and it will be my go to recipe from now on. I made a batch to can with the cumin and had some left over. I decided to add some cilantro to the half jar I had left and it was to die for. Thanks so much. Grandma, oh, thank you so much! I also add cilantro when I can get it–it has such a sadly short season in my garden that I usually don’t have it at hand, though! I would LOVE it SO MUCH if you would share the recipe with your friends. Thanks and happy munching! I have already shared your recipe on my timeline and I did give you the credit. Have you thought of freezing your cilantro? I think that would work. I didn’t have any fresh so I just used the dried cilantro in the spice aisle. I know, not the same. Absolutely, Dottie, I have! I have done that in the past, but often I just miss that window between when the cilantro is ready for harvest, and when it has bolted and gone to seed. But it’s a great idea if I could just remember to do it! Thanks for the reminder about the cilantro. I do LOVE the taste of cilantro in that recipe! It says 1-2 T of cumin. Is that tsp of tbsp?